Bring the warmth and serenity of a roaring fire packaged in a little reliable unit when you purchase this wall furnace. The wall furnace Empire design efficiently generates 15,000 BTUs of heat, 60 cu. ft. per minute output, and an easy through-wall venting that requires no chimney or electricity. The automatic shut-off will keep you secure and comes with a 10-year warranty for the combustion chamber and a 1-year limited warranty for parts. Natural gas and propane models are available at your convenience. Can you vent this heater from an interior wall through the ceiling? This can only be installed on an exterior wall with the rear vent termination kit. What is the longest vent pipe that I can use on this direct vent furnace? The maximum length allowed is 13" for venting this unit. I'm using a 20 lb tank and the unit as a back up so does this unit need a regulator ? On a medium setting estimate how many hours the might run on the 20 lb tank ? What unit should I order for a 13 inch wall ? Do you have a vent 14 or 15 inches long ? If so what unit number ? A little over 28 hours. What psi does this operate on ? How do you regulate the temperature? This unit comes with a millivolt thermostat shown as part #32 in the product's manual. Does this include a blower? This will not include a blower, however, the optional blower is shown under "Popular Accessories for this Item" on the product page for the item in question. I have the DV215 installed in a cabin in northern Wi. that has no electricity. It is 400 sq. ft. and well insulated. The heater is fine in early Fall but can not warm the cabin when the outside temp. is in single digits. If I were to put in a blower would that do the job, I could run it with a generator, but can I then operate the heater without using the blower in milder temps? The issue may not be solved by adding the blower as you have installed a heater that does not have a Btu rating high enough to heat the space. While you would need around 14,000 Btu and this heater has a Btu input of 15,000, the efficiency of this heater is 64.4%, lowering the Btu output to about 9,660. 9,660 Btus will heat a space of approximately 276 square feet and you have 400 square feet, so I would recommend considering a heater with a higher Btu input. 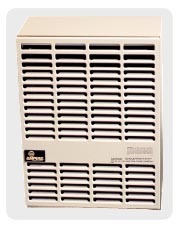 The Empire DV25SG Direct Vent Gas Wall Furnace - Propane - DV-25-SGLP would be better suited with a Btu output of 16,750. To answer your question, you could always turn the blower off by simply unplugging the blower in the milder months. Do you sell the vent kit separate from the heater? The vent kit is included with this heater. A hundred pound tank would likely make a difference, because your heater is probably causing the tank to freeze up in use by draining it too quickly. This will be used for a fish house in very cold weather. How many square ft. will this product heat? This heater will heat approximately 300 square feet, but it will be more effective with the optional DVB1 blower added. How many BTUs should I have for 650 square feet? Also, how far from the window or door should I be venting? On average, 15K BTUs should be enough. The termination of the vent needs to be at least 6" from any building openings. In order to vent thru our outside wall we would need 29 inches of pipe. Will that affect the way this heater works in any way? The vent kit for this furnace can not be vented horizontally further than 19". Does this unit also draw its combustion air from outside the living space? Yes, as a direct vent gas appliance, it uses combustion air pulled in from outside via the termination cap that is to be installed on an exterior wall. Does the vent kit and thermostat come with the product? This product does indeed come complete with the wall thermostat and venting kit necessary for installation. What is the efficiency rating for this furnace? Per the manufacturer, this furnace has an efficiency rating of 64.4%.